It's a little early on the PTR, but it looks like you have to fight 3 trainers (with 3 legendary pets each) and then 4 legendary pets, for a total of 7 fights. The twist? It's instanced and you cannot heal your pets. If you want to heal your pets, you must leave the instance and by doing so reset your progress. That means you most likely need to prepare a team of about 21 different level 25 pets. The other twist? The teams you fight may change with each weekly reset (not fully confirmed yet). No cookie cutter team that you can use every week: you will actually have to rethink your setup each week. note that there is a one-time quest (The Rainy Day is Here)associated with this that rewards you with 2 coins. Yes, you can buy one of the 4 celestial pets the very first week of the tournament, and it will take you a total of 9 weeks + 1 day minimum to buy all four. Edit: The one-time quest is account-wide. Blizzard does not want you to log in with 4 alts and get your four celestial pets in barely over three weeks. After 20+ hours of desperate attempts and 100+ dead pets I was finally able to complete the Celestial Tournament. This quest is insanely hard but the rewards from it are well worth the effort. Here is how to beat the 4 Celestial Pets along with Lil' Oondasta. The Celestial Tournament consists of total 7 fights ( 3 legendary pet teams and 4 legendary elite boss solo pets ). The pet tamers are fairly easy so I'm only going to explain the celestial pet fights. The tournament is a solo scenario weekly quest. However, you can fight Lil' Oondasta every day just outside the arena. You need fast pets with strong humanoid attacks. Pets with interrupts ( Kick ) such as Dandelion do very well but mine weren't able to beat her. Her first ability is her shield so make sure you damage her before she puts it up. After that spam your interrupt and dodge abilities as much as possible. She no longer has Life Exchange - She now uses Lift-Off which makes her fairly easy although it does a lot of damage. Chi-Chi now starts with Tranquility, followed up by Quills and only after that does she use her Ethereal. I started off by using Feedback followed up by Deflect and afterwards I use my Amplify Magic. After your Wyrmling dies, switch to one of the Porcupettes and time your Spectral Spikes which wins you the fight. Afterwards you just need to spam Powerball while Spectral Spine and Spikes ore on cooldown. I used the Darkmoon Zeppelins for 2 specific reasons. Their Explode ability which deals a very nice amount of damage and more importantly their block ability. All you need to do is use Block when Xu-Fu drops to ~70% hp to block his Feed. The rest is just dealing as much damage as possible. Nothing special about this fight. Open with Fel Immolate followed up by Call Lightning. Spam Fel Immolate until your Micro-Sentry dies ( Not more than 1 turn after using Call Lightning ). After that victory becomes simple. Switch to one of the Zandalari Anklerenders, use Black Claw and proceed with Hunting Party which is supposed to end the battle. You won't even need to use your third pet. This fight is a little bit different than Zao. You open with Call Lightning. Right after that your pet get's switched to one of the Zandalari Anklerenders for free because of Oondasta's ability. Proceed with Black Claw and then Hunting Party. If Oondasta is still alive after that and your raptor dies, just use your second one. UPDATE: Added Lil' Oondasta fight to the guide and updated the other 4 fights' explanations and team compositions. I hope this was helpful and wish everyone good luck! The requirements for this are clearly stated by the NPC who gives the quest. "When you have trained 15 pets to their maximum level, you will be deemed ready." As stym has pointed out, it's probably best not to try it without at least 20+ pets. I waaaaaaaay overestimated the difficulty of this tournament. No offense to globex45 but your comment scared the crap out of me. It made it sound much more difficult than it is. I spent a few weeks levelling up a ton of pets to 25 thinking this would be one hell of a challenge. I ended up with around 80-ish pets at 25, ALL of them rare quality and I chose pets that had some very good combo moves specifically. (for example I farmed 3 unborn valks/water elementals/chrominius, and 3 darkmoon zeps, etc). I basically one-shot each of the trainers and the pets. I never wiped and almost always had a pet left at full health. General strategy is simple. If it's your first time like it was mine, and didn't read up on any of the trainers. Start out by engaging the trainer with no preparation. Mouse over his pets, see their moves, see their types. Then just run from the battle) (no penalty). Pick a pet that counters each of theirs. If they have a two round ability, make sure to counter with a pet that has an avoidance ability (like Anubis idol). The three trainers were easy mode. For the celestials it's literally a faceroll fest. Two of them get destroyed by the the valk/ele/chromi combo (bird and yak). For Xuen I used 3 darkmoon zeps with a faceroll strategy. Open with decoy, missile twice, then blow yourself up. He'll use his heal on the decoy. For Yu'lon I used two anubis idols and a flayer. Basically tried to destroyer her with humanoid abilities. I only escaped with one anubis left alive so I'd like a better strategy for her next time. I recommend you have around 20 pets, but I definitely see the possibility of doing it with 15. If possible tailor them t being able to counter that week's trainers. If planned properly you can probably do it with 15 pets. I definitely recommend having at least two of the water element/chromi combos to just faceroll two of the celestials, I'll try the combo on Yu'lon next week. Good luck, enjoy your pet! This is just simply not fun. I have 40 25's and I'm still getting stuck on the Tamers. You will simply waste too much time in here while the rest of the island is enjoying themselves. i have 52 level 25 pets. i can make it thru the regular trainers (3 legendary pets each) with nearly unscathed pets. the "im a boss" buff the celestials have make it pretty impossible. guess ill go level another 52 pets to 25 so i can have a slight chance of beating them... not yet worth wasting all your time here and missing out on the cool stuff u could be getting! you need to be sure to level up 3 or 4 of your favorite pets because you won't be able to use them again when they die. Apocalypse stalling tactic WILL NOT WORK for the celestial bosses. When the meteor hits a debuff appears on the celestial saying BOSS: No single attack can do more than 35% of total life. Depending on your team makeup these can be pretty straightforward battles. I have beaten Xu-Fu in a couple of ways but the easiest is on the first turn (assuming slower speed than the boss, use call lightning. Immediately switch into a turkey or chicken with flock (they'll take reduced damage from his spectral claws) flock until the bird dies. You may need one last mechanical. Something with ion cannon would be a nice finisher. For Yu'la, I started with Pandaren Monk using blackout kick (he is 2 speed faster so you will get the stun before she can defend) Takedown for double damage, damage reducer on third turn to lower the pain of her lift-off. If you time his blackout kick to right before her shield fades, your next takedown will do the full double damage again. If your timing is right, he is the ONLY pet you will need in this fight. Other humanoid pets with the stun takedown combo I highly recommend like Kun-Lai runt. Anubisath was quite good due to being able to block the lift-off attack as well. Chi-Chi has now been beaten with ease thanks to Stym's suggestion. Use 2 snails. Acidic touch to keep the debuff on Chi-Chi and ooze touch every other turn. I also used dive so I didn't have a wasted turn while Chi-Chi went ethereal. I understand the grief this tournament is causing. Some of these fights are VERY tough and require to use specific abilities/types. No longer can you just use your favorites. However, I appreciate that these pets will be more rare and only the die-hard pet-battlers will be able to show them off. (not cageable) They really feel like the most worthy prize of pet enthusiasts who have gotten this far. I would highly recommend having a pretty decent stable of leveled/rare pets to draw from for this. The three trainers you fight first I was able to dispatch pretty easily - the celestial pets took a little more time (Chi-Chi I found to be an absolute nightmare). But all told it probably took me no more than 90 minutes of trial and error to get teams that seemed to work. Sully - I used a rabbit (which I think could be replaced with about anything), a jungle grub and an oasis moth. The rabbit died really quickly, but my other two pets were able to kill them with no problem. Goldbloom - I used Clockwork gnome (I only have one but was able to use him multiple times as his health was whittled down :P), Chrominius, and the Anubisath Idol. Cho - I used Jade Oozling, Emerald Proto-Whelp, Feral Vermling - didn't have any problems with this one and my Feral Vermling was pretty much at full health when Cho's last pet died. Zao - I used Sunreaver Micro-Sentry, Clockwork Gnome, and my Cogblade Raptor which made quick work of him. Xu-Fu - I used the Clockwork Gnome, Lil' XT, & my Cogblade Raptor he was quickly beaten. Yu'la - I found humanoids with interrupts worked well on her - so I used Feral Vermling, Flayer Youngling, and the Pandaren Monk pet (which was INCREDIBLY useful for this particular fight). Chi-Chi I found to be the worst and I spent the most time working on her and went through a lot of dead first/second pets before finally getting a group that worked for her - I used Lil' Deathwing (his call darkness ability was useful against her healing), Infinite Whelpling & finished with Nexus Whelpling. Bottom line it's not impossible, the first time I imagine will be the most difficult once you find teams that work you should be able to utilize them easily next go around (tip: highly recommend Petbattle teams addon for that). I would also imagine there are multiple team building options that will work for these particular battles - I just thought I would post what worked for me on the off chance it would help someone. When he died I switched to my Nexus Whelpling (P/P). started with Mana Surge, Arcane Storm, and then spammed Tail Sweep until everyone was dead. Didn't need a third pet. I used him until he died to the magic pet that came out next. Next I used my Emerald Proto-Whelp with Emerald Presence and Breath until the magic pet died. Cho's third pet was a dragon who killed my proto-whelp before he could do much damage. I used Annubis Idol with Sandstorm->Crush and took out his dragon. Chi-Chi (100% my own strat here): Start with Unborn Val'kyr. Use Doom, then spam Shadow Slash until dead. On resurrection, use Unholy Ascension. Next I used Nether Fairie: Spam Arcane Blast and use Evanescence on cool down. If you need a third pet, pick anything except Mechanical. I used Lil'Rag just for kicks. Zao: I used Skywisp Moth (one of the three new moths on Timeless Isles): Started with Call Lightning, Counterspell on cool down, and used reckless strikes. After he went down, I switched to Zandalari Footslasher with Exposed Wounds and Hunting Party. I didn't need a third pet. Yu'la: I used Scourged Whelpling (because I didn't have a stitched pup like someone else mentioned in this thread). Started with Plagued Blood, then Call Darkness, and spammed Tail Sweep until dead. Switched to Clock'em and used Dodge to avoid Lift-Off and used Jab. I had my Anubisath Idol in reserve but didnt need it. All in all a nice challenge. -It's a solo scenario, so you won't be competing with other players laughing at you. -You can't revive battle pets, clicking on "Revive Battle Pets" or a "Battle Pet Bandage" will give you a "you can't do that now" message. You don't need to worry about reflexively clicking the heal button and getting thrown out. -Your pets CAN use healing abilities in battle, only reviving is prohibited. -You will know who you're facing. Rather than being shoved into a room with random encounters coming at you and needing to improvise, you can see who you are fighting before you start and plan your team accordingly. You can also choose the order in which you fight them. -You can use and switch out as many pets as you have. You are not going into a straight gauntlet of pet battles with no room to breathe. -There is no time limit. Take as much time as you need to rearrange your pets, read up on fights, and get a drink. Keep in mind that, since this is a scenario, you will need to start over if you leave. -The three trainers you fight are reset once a week. The trainers you face on Tuesday will be the ones you face for the rest of the week. You don't have to worry about your opponents randomly changing when you leave the tournament. -The three trainers seem to rotate in teams of three. It will take a few weeks to know for sure, but it's the fourth week and I'm seeing the same team as I did on the first week. *If a Mechanical pet dies and is revived by the failsafe, the pet will be alive if you flee. Various teams you can face. For a detailed look at a trainer's pets including stat summaries, or to compare a trainer team to your own team, check out the "team links" for the Battle Pet Team Calculator. Although you cannot heal outside of battle, you can of course heal your pets during battle using pet abilities. If you have a pet with a team heal ability, such as Inspiring Song, you can simply use the ability, heal up your pets, forfeit the match, and repeat until all pets are healed up again. Dr. Ion Goldbloom and Chi-Chi are fantastic for this tactic, as they do not attack on the first round. Dr. Ion will send in Screamer who always uses Lift-Off, and Chi-Chi always casts Tranquility on the first round. This made things a lot less frustrating for me, as it allowed me to form an effective strategy for each battle and test my pet abilities without having to reset the entire Scenario. It's also helpful to be able to reuse favorite pets without wasting precious rounds to heal them in battle. I'm stuck on Chi-Chi. And as someone already said it here - this is simply not fun. And a game should be FUN - I think Blizz forgot about that. I've wasted so much time yesterday on that quest it's unbelievable. UPDATE: Got to it again today and finally made it. Thanks to everyone who commented here and gave their tips, I used some of your ideas. I'm happy to have won but it still takes way to much time than it should. A number of players seem to be having a hard time with Chi-Chi. With the proper pet setup, Chi-Chi is the easiest of the four celestials. Chi-Chi only has an elemental attack, which is weak against critters. Snails are critters. Chi-Chi is a flying pet and takes extra magic damage. Snails have a magic attack. Whether you have a Rapana Whelk, Rusty Snail, Shimmershell Snail, Silkbead Snail or Scooter the Snail does not matter, they all have the same abilities. Maintain the Acidic Goo debuff at all times and spam Ooze Touch. Use Dive during the third round when Chi-Chi goes Ethereal. Since Chi-Chi uses that ability on cooldown thereafter, you will not be able to use Dive each time, but each time you use it during her Ethereal, you save yourself about 500 health from the subsequent quills. Definitely do that, and thank Anistasia for the tip, as it allows you to end the fight with your second snail at more than half health! I killed Chi-Chi with two snails, and had an Arcane Eye as a backup in case Chi-Chi needed to be finished, but he did not see combat. Note that I tried using Shell Shield instead of Acidic Goo, and got my behind handed to me. It is really important to maintain that debuff. use Eyeblast on the first round, one time is enough to give you the initiative. Use Interrupting Gaze for a free round and either Focused Beams or Psychic Blast thereafter. You should not need to use that third ability more than once or twice. Chrominius would also be a great "finisher" with Howl and Surge of Power. just don't throw your surge if Chi-Chi's Ethereal is off cooldown. The fight might last longer if you miss a dive or Chi-Chi decides to pop tranquility in round 10, but you have Dive available at round 11 for his next ethereal and your trusty Darkmoon/Arcane eye if things go south. I haven't seen Chi-Chi pop tranquility a second time in the past few months. If Chi-Chi somehow destroys your team, switch to the Pandaren Water Spirit/Chrominius nuke strategy. I never had to do that but it's good to have a backup strat. Please post if you are still having trouble with him and this strategy. I actually found a really fantastic team comp for Yu'la that doesn't rely on doubles or every humanoid with Kick in the game: Unborn Val'kyr (Shadow Slash/Curse of Doom/Unholy Ascension), Flayer Youngling (Blitz/Deflection/Kick), and Kun-Lai Runt (Takedown/Frost Shock/Deep Freeze). Lead with the Val'kyr. Shadow Slash on the first turn, wait for her to Lift Off, then Curse of Doom on the turn she completes Lift Off, then Shadow Slash until killed (ideally when there's two turns remaining on Curse of Doom). Unholy Ascension, switch to the Flayer when the Val'kyr dies, kick Yu'la so she can't put Emerald Presence back up and Curse of Doom hits her for the full ~480 damage. Follow up with Blitz on the turn she puts Emerald Presence back up, pass when she uses Lift Off, Deflect the second turn of Lift Off, then switch to the Runt. By this point she should be two turns from losing Emerald Presence; obviously you lose a turn when you switch in, but she can't one-shot your Runt so you are golden by this point. Frost Shock followed by Deep Freeze, and if she's not dead that round (which she should be), you can end the fight with Takedown. *Note – the first week only Lorewalker Cho, Dr. Ion Goldbloom and Sully "The Pickle" McLeary were up for battle. As the other 1st round opponents come up, I'll add strategies for them as well. Strat: Moonfire, Tranquility, Emerald Bite – Use Tranquility on cooldown. When your Emerald Whelpling dies, bring in your Stunted Direhorn. Primal Cry first, then Horn Attack, then Trihorn Charge – repeat HA/TC until speed buff falls off then reapply Primal Cry. Every time I killed his pets with just my first 2. You could easily sub in any pet for the 3rd slot as long as it isn't undead or critter type. Strat: Moonfire first, followed by Ancient Blessing, then Flamethrower until he swaps out. As soon as he swaps to Trike, swap to your Moth. Moth Dust, Cocoon Strike and Alpha Strike until your moth is dead. Bring Celestial Dragon back in and Moonfire. Get Skreamer down again with your Celestial Dragon. When he swaps to Chaos, bring in your Scourged Whelpling and kill him. Swap back to Celestial Dragon if Skreamer is still up and finish him off. Strat: Swarm of Flies, then Bubble, then continue with Tongue Lash. You should kill Socks. Get another swarm off on Monte and Tongue Lash until your frog is dead. Bring in your crow. Call Darkness, and Nocturnal Strike unless Monte is <380hp (and your crow's speed is at least 282). If Monte is lower than 380hp and u have speed, then you can just Alpha Strike. The last pet is super annoying because of Cute Face. It's very RNG. Call Darkness/Nocturnal Strike on CD, then Alpha Strike until this crow dies. Then repeat the same pattern with your Gilnean Raven. *Note: Chi Chi and Zao are going to use the SAME TEAM. You can have multiples of this these pets if you want, but it's unnecessary. You will already need another set of this team for Xu-Fu. Strat: You MUST do this order: Geyser, Whirlpool – Swap to Chrominius – Howl, Surge of Power. If Chi-Chi doesn't die, swap to Rapana Whelk and finish him off. YOU WILL CONTINUE WITH THIS SAME TEAM TO ZAO. Same pets you used for Chi-Chi. If they're half health or even lower, it's ok.
Strat: CAST WATER JET FIRST - Then Geyser, Whirlpool – Swap to Chrominius – Howl, Surge of Power. Strat: Geyser, Whirlpool – Swap to Chrominius – Howl, Surge of Power – This should get him nearly dead. If he uses his Feed, you can still finish him off just spamming Metal Fist. Strat: Plagued Blood first (his first move is Emerald Presence), then waste a Diseased Bite while he's in the air. When he lands, Howl. Spam Diseased Bite. Howl again on your 'return to life for 1 round ability'. Use Call Darkness (unless he's doing Lift-Off). Spam Shadowflame. Once your Dark Whelpling dies, spam Crush and use Deflection on his Lift-Off if you have to. -- Try to use your pets that you've leveled, but arent super fond of for the trainers. Personally, the trainers weren't too hard for me, so this was the time to try out new pets. -- Yu'la always casts her buff first, so if you have left over pets that didn't die from the trainers, you can use her to do a group heal on wounded pets, using something like . Forfit her fight, rinse and repeat. Ion: his team is flying, magic, beast. I personally used a crimson geode and fel flame. These two took care of the team. Cho: This one can be a bit confusing, but you're sure to do fine. Cho's team consists of flying, magic, and dragonkin. Personally I used a nexus whelpling, pandaren fire spirit and a kunlai summit yeti (green quality, random fodder I had at 25). Yeti survived with full health. Taran is kind of a jerk. Team consists of 3 pandaren monks. I cheezed the fight with a level 24 lofty libram (with it's curse), and 2 wolves - both with howl. This effectively oneshots each monk when the curse goes off. Make sure to time the howls so they coincide. The libram is kind of nice for this because it cannot take really devastating shots - being magical. Alternatively, use a Lost of Lordaeron with curse, a random wolf, and a Stitched Pup - make sure to wear out the wolf first, and you can use the wolf corpse to heal the stitched pup. These two teams can rely on luck, once in a while. Alternatively, Anistasia's team also works (sprout with crouch, creeping fungus and charge, and two grubs with leap and consume). Chen was probably the hardest of the three for me. I tried a few different combos, wanting to save my mechanical pets. His team consists of a beast, critter, and elemental. My personal team consisted of a moth (alpha strike, cocoon, and dust), spider (brittle webbing, spiderling swarm), and crab (with geyser, and surge.) Another strong contender if you do not wish to use moths would be Fluxfire Feline. Use prowl + flux, and claw when neither are up. Shademaster personal team: Restless shadeling, Water Waveling, Tiny Harvester. Cast plagued blood, then shadow shock until you die. Hopefully you kill the humanoid first. Then once you use waveling, cast geyser. Frost Nova to chill, then cast ice lance until one of you is dead. With Tiny Harvester, I used extra plating, and then demolished until Summer was gone. Mari personal team: Moth, scourged whelpling, water skimmer. Blingtron personal team: thundertail, kun lai runt, fel flame. beaver dam, then slap. use all beast attacks with kun lai runt. when you use fel flame, scourged earth, conflag, and then burn. Chi-chi didn't give me too much trouble personally. I went with an unborn valkyr, chominius dragon, and emerald whelpling. Cast haunt with valkyr, then your 1 slot until you die. Cast ascension on your last round. Bring in chrom, cast howl and surge. Once chrom dies, bring in emerald whelp and onyx bite until win. Zao: arctic fox, blighted squirrel, and clock gnome. Cast howl with fox, switch to blighted squirrel. Cast woodchip, switch to stampede. Youll die quick, but that's okay. Now go to gnome, build a turret and punch until win. Yu-la: Anubisath idol, dark-dragon (i used lil deathwing - can also do feline familiar), vermling. Use Anubisath's dodge ability when Yula is about to strike down from her flight. Punch until dead. Switch to middle pet - cast your call darkness, and whatever else you can. Once dead, go to vermling and attach with humanoid attack. Xu-Fu is my own personal hell. I got Xu down using a Golden Hatchling (any pet with call lightning works here), Cogblade Raptor (look for a debuff that adds extra damage per attack - raptors work here well), and your Clockwork Gnome. Cast Lightning, switch to raptor. Cast debuff here, switch immediately to Gnome. Build turrets, and then just punch your way to victory. Nothing quite like ALMOST winning only to see your last opponent get a string of crits! Or even better, having the server crash right before you win! Thanks to compiling tons of different strategies from different Wowhead posters, here's the short list of what I used to kill the 4 Celestials. This means these are the pets I excluded from my teams for the first 3 trainers in the Celestial Tournament. Obviously the teams you'll compose for the trainers will vary week by week, but having to only reserve 9 pets for the Celestials seems like a good thing. I suggest doing the Celestias in the order I list them. You use Lil Bad Wolf for both Zao and Yu'la, so you need to do Zao first (he will be mostly unharmed by Zao, Yu'la will kill him). Leave Chi Chi for last so you can use a healing pet on first round with Chi Chi to heal between fights if you have a double use pet (like Lil Bad Wolf) that needs to be brought to full before the next fight. Explode should finish him off, but if not you should use a big nuke from your last mech to finish him. Credit for this strat belongs to someone else, but I can't find who I stole it from, sorry! 2: Swap to Wild Jade Hatchling (or Skywisp Moth). Soaks the charge. Again, stole this from another poster - strat works perfectly. Turret + Call Lightning + Howl in the last round destroys him. Open with LBW - Claw, Dodge while Yu'la is in air, Howl. Continue to use Claw until you can Dodge again - it should coincide with Yu'la's liftoff, if you make it that far. Personally, my LBW got smashed pretty quick. Next, Pandaren Monk - Blackout Kick, Takedown, make sure Staggered Steps is up to defray the damage from liftoff. Most of the work on this boss was done by my Pandaren Monk, hitting for 150 points at a time (ugh). Once monk is dead, finish off with Anub Idol, use deflection against liftoff damage. Just keep up acidic goo and ooze touch to death. Should only take the first 2 snails to kill Chi Chi. VERY IMPORTANT NOTE: Chi Chi will always cast ethereal on round 3 and then every 4th round thereafter (round 3, 7, 11, 15, 19 etc). Plan your dives accordingly. Credit to Stym for that one. There you have it - all 4 Celestials dead with 9 pets. Happy Pet Battling to you! Chi-Chi, use 2 snails and any other pet (which you won't need). She only has 1 attack which is weak to critters, and snails are the only critters with anti-flying attacks. My 1st line snail was slower than she was, so I opened with Acidic Goo, used Ooze Touch once, then Dive. This way, your Dive is timed to when she becomes immune to attack, but you resurface when her immunity wears. Keep up Acidic Goo, spam Ooze Touch and time your Dives to when she's going to cast her immunity and you've an easy win. Even if you can't time your Dives right, it's still an easy win. Your 1st snail will die, but your second will only be half health when she goes down. Xu-Fu and Xao, use amccord's pet lineup and strat. Do Xu-Fu first because he hits harder. It's OK if you move on to Xao with the same pets at half-health - they'll survive. (If you're truly concerned, leave your Yu'la or Chi-Chi fight to last so you can use it to "heal up" your pets. The strat for this is posted by Klinny in this thread). Yu'la, I tried EVERYTHING. Boy, I thought Chi-Chi was hard. Then I saw the suggestion of using Pandaren Monk against her, and that was the key to a win. He's faster than she is, so you can get your Blackout Kick in before she buffs herself. Cast Takedown next, for double damage because she's stunned. Use Staggered Steps to deflect the blow from Lift-Off. Otherwise, spam Takedown. The move before Emerald Presence wears off use your Blackout Kick again so you can get Takedown double damage. If by chance your monk dies (he may be the only pet you need), Anubisath Idol with Deflection and Crush is a nice finisher, only using Deflection for the Lift-Off, otherwise spamming Crush. Win! Chi-Chi - I had most problems on this, like 5 teams wipped off by her... but a post here helped a lot to use criters , I started with Nexus Whelpling for Wild magic , make sure you apply it before you die so the criterrs have it. You can use any critter pet you have with stampede take the ones with most attack. <name>, I can see the look in your eyes. I have heard of your deeds in the tournament. You are ready to choose a companion! This one time I will gift you these two additional coins. Use them wisely, as you will only be able to earn one coin each week from this point forward. All that being said; you will need nine more weeks to get all these cute mini-Gods! Have fun and good luck! I just wasted a lot of money in the AH in pets for nothing but oh well... The gods were pleased. Here is my strategy, I hope it helps you. It took me about 1 hour of tries and 2-3 hours to think a strategy with my pet rooster (100+). 1) First of all you should really have petbattleinfo e petbattleteam addons. All your pets must be rare. 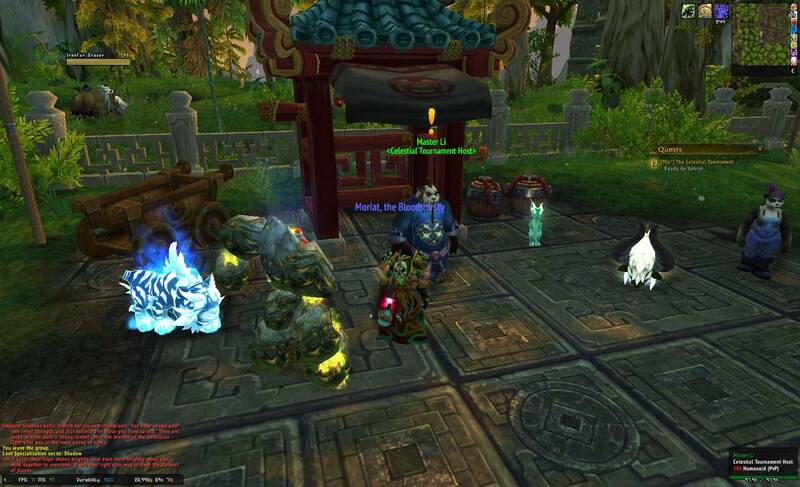 2) you can restore your pets health's at Chi-Ji with a Cricket and forfeit. You cannot revive them ofc. If your pet is still alive and you made a mistake, forfeit, heal at Chi-Ji and try again, don't let your "I-WIN" pet die. 3) Tamers can be a problem but the celestials are way more difficult, Xu-Fu and Chi-Ji are very OP. Yu'la is the most simple. NOTE: use Blighthawk "Ghostly Bite" before his second pet bandage himself for half life. Just sharing my pets used, to give some more alternative strategies. I'm not going into great detail of which moves used and when, if you've come this far you probably are experienced enough to figure it out yourself. Shell Shield makes these stay alive pretty long, proper use of the Nether Faerie Dragon should already have the boss on half of its health by now. Don't get cocky and always have a shield up. Try to time it with moments the boss will always dodge. Dive also helps avoiding damage. Or any Mechanical with Call Lightning, best to use that one round after bringing it in. They never last very long. Turret + Lightning does miracles, and even negates a second heal. Just use Metal Fist to finish him off. You should manage before this pet has to use any Failsafe mechanics. Now, assuming you're not rich on Mechanical pets after the Zao fight, Flying pets can also work. Quite tricky, but cheap on your essential Mechanicals. Or any Flying with the Flock ability. Open with any other damaging ability, use Flock second. This pet is likely to die the next round. Or any Moth, as long as the Moth Dust ability is present. Doubling its damage, easily taking away one third of the boss's health. Low enough to make him start using his Feed ability. As you're always faster with these flying pets, block his next Feed with Cocoon Strike. Or another Moth, Cocoon Strike is what matters. 4 Rounds after the blocked Feed ability he will use it again. Block it once again with Cocoon Strike and you're in the clear for killing him. Alternative to using only the Pandaren Monk, I will use him last in this strategy. Open with Call Darkness, follow up with Elementium Bolt as soon as Ya'la lifts off. Tail Sweep until you can use either again. Structure remains unchanged. Dreadful Breath is not recommended, for it does very little damage. Either Use Call Darkness instantly, or right before dying, the Monk will thank you later. Open with Fury of 1k Fists, follow with Takedown. Boss will likely Lift Off once freed from the stun, use either secondary ability while she's up there. Finish it off on landing (if it even gets that far). Good luck out there and may the RNG be kind on you. Those 3 Monks are just ^&*!ING annoying. Not to mention Frosty. Ive spend 20+ hours already trying to beat any of the 3 trainers and no luck. And i got 75+ Pets. Blizzard needs to test their ! @#$ or not even bother with PTR (Public Teaparty Realm) anymore. If anyone is having diffculties defeating the first three champions, here is my pet combination that seems to work every time. Start with Shell Shield and spam Powerball until Cindy and your turtle are dead. If there are remaining stacks of Blistering Cold, start with Stoneskin from Anubisath Idol and then spam Crush. Mind to use Deflection immediately after you get the burning debuff. On Peddlefeet use Perfumed Arrow on cd, Love Potion when you take 1-2 hits and Bow Shot the rest of the time. Start with Decoy, Bombing Run and then Breath until the beast is dead. With the Dandelion Frolicker spam bite and the critter should die when he is around half health. On the Dancing Water skimmer just use Pumpx4 and heal yourself whenever necessary. Start with Peck (or Alpha Strike), then Call Darkness and Nocturnal Strike. Spam th first attack until the first pet is dead. on the Mechanical Pandaren Dragonling start with Decoy, then spam Breath. I actually managed to defeat this trainer with only 2 pets, but just in case, bring a strong aquatic pet like the skimmer to finish the elemental off. So I've spent quite a bit of time on this fight and most of em are pretty easy ish common sense wise on how to beat. My two mountain tops to climb were Chi Chi and Zao. They both just wrecked my world for hours. So here's my strat, I hope you like it and I hope it works as well for you as it worked for me. Curse of Doom then Haunt right off the bat. You may be able to use Unholy Ascension. I have not tried it but I will be this week to see if it makes a difference. Howl right away. Curse of Doom will go off without howl based on turns, but the rest of these will go off with howl causing massive damage all in one to two turns. I was able to use all 3 pets again with this strat (which is why I used haunt instead of UA). So to recap with this strategy I killed chi chi, then used Zao to heal up with a turnip to get all 3 of those pets topped off again. Then used the same strat on Zao. He died before his first heal went off. Comment with a question or let me know how it works for you guys. Best of luck to all my pet nerds out there. *Edit: this strat also works well on the fabled beasts...unsure if they gave those guys a buff that doesn't allow a roach's apoc to work like they did the celestials but its pretty solid and alot of up front damage in a very short amount of time. how to enter the tournament? Master Li don't give it anymore. So two weeks in - I thought I'd share my strategies so far. Some may be similar to those posted, others use different pets purely based on what I have. Pets used: Tolai Hare Pup, Lil K.T. Scourged Whelping. Used the rabbit to bring down the undead with Dodge and Burrow to avoid the stun. For the other two pets I chose undeads to reduce damage taken - plus the whelpling has Call Darkness for bonus damage. Overall this wasn't a challenging trainer so my strategy hasn't been changed much. All were specced Alpha Strike/ Cocoon / Moth Dust. My third was a level 23 green and most of the time didn't get used - but being able to avoid a good proportion of the attacks made the world of difference. Again I used the moth to avoid big hits from the beast, the spider eats through the cricket's health if you throw brittle webbing on it. The Thundertail could probably be replaced by anything that damages elementals. It was usually my moth finishing it off anyway, as I swapped it back in after spiders. That was last week's trainers... felt a lot easier than this week's! Open with alpha strike, into cocoon and moth dust. From then on use cocoon on cd until the elemental dies. Take as much health off the pig as possible with your moth before swapping in your spider. The aim is to have your spider up for brittle webbing on LilBling too - use swarm and then strike. Again it won't take too long to die. Raggy hits hard - so Bling won't live too long, particularly if you can get web up. This one caused me a fair few problems - eventually found a strategy that seemed to work every time; I cast CoD, then death gripped the yeti away. Swap immediately to FFF, cast prowl, then overpower, spam pounce. Usually the wolf would die and I would get 1/2 hits on the yeti again. When the FFF died I brought the claw back in and finished him off with shadow slash. I then had my claw tank his FFF for a bit - making sure I got CoD on it. My fire spirit made quick work of his totems (lave wave), and between the flamethrower dot and conflagrate it died pretty quickly. This was another nightmare compared to last week's trainers. I was getting destroyed by the magic attack, combined with the heal. So I changed to using XT with Heartbreaker and Tantrum. Use both on cooldown - and fill in the gaps with Zap. This is even useful when facing the magic pet alone, as because tantrum hits the front pet twice it negates hit shield while still doing a bit of damage. My XT would die when the boss had ~300-400 hp left. I would switch in my anklerender and use bloodfang to finish him off. For the first couple of turns on the water ele I would just use black claw - I didn't want to lose any effective part of hunting party. Normally hunting party was enough to finish him off; the only time I wasn't able to do that is when his whirlpool crit. As a note you could probably use any beasts alongside XT - they take reduced dmg from the first boss' AoE. The easiest celestial by far due to no heals! I used deflection to avoid the Lift-Off, and just whittled away her health. Make sure you don't miss your combo on KunLai because of lift off, and she will die. Start off with plating/call lightning. Switch to Zep after he died and put up decoy. Explode and then finish him off with the Tonk. My jade hatchling was literally only there to throw up call lightning - i never got round to levelling a 2nd pet with it, and it was a level 23 white quality. Gnome to build turret on cd, he actually managed to cast wish once and I still had enough to beat him. If you have a stronger first pet though, that probably wouldn't happen. Pets used: Rapana Whelk x 2, Tainted Waveling. My least favourite by far; the 2nd Rapana Whelk was another fresh catch, but between these three I was able to keep up Acidic Goo debuff and use ooze touch. Try and time your dives for when he is going to use the 100% dodge ability. There we go - bosses so far :) hope it was helpful - if you have any questions and/or want more detail just reply and I'll see what I can do! People having problems with him might wanna try the team i used. Pretty annoying guy to battle against. But i found a team that worked well against him. Crunchy Scorpion : snap,screech and rampage. only used water jet to finish the last pet off. None of my pets died.Soon as Little XT was nearly dead i swapped to the Scorpion,used rampage to kill off the second pet. Switched to Water Waveling to finish off the last pet with one water jet. stone rush followed by rupture should finish off her second pet more or less. Dancing Water Skimmer : started with pump x2 , healing wave and finish first pet off with water jet. Swap to Electrified Razertooth. Electrified Razertooth : Rip followed by Blood in the water one more rip and finish off with Devour wich will heal you for next round if all goes well. I just do one more Rip on Lil'b and swap to Fel Flame. Fel Flame : start with Immolate followed by Conflagrate (his plating should be down right now) and finish him off with Burn. I’m putting this guide up so people have some other options if a certain pet is dead or they just don’t have one of the pets listed on this forum. I too had about 60 pets die on me during the first tournament, but the second time I did it I was more around 20 pets dead. Start with Lost of Lordaeron and put Curse of Doom on Chi-Chi. Switch to Water Spirit and put up Geyser and then Whirlpool. Switch to Stitch and use Howl. If your Lost of Lordaeron is dead you can also use Unborn Val’kyr or Creepy Crate with Cruse of Doom. If Stitch is dead you can use Chrominius or Alpine Foxling Kit with Howl. Kun-Lai Runt can basically solo this guy. Start with Frost Shock, then Deep Freeze, then Take Down. Keep doing the same rotation when Deep Freeze is off cool down. A good back up to have if your Runt dies is the Anubisath Idol and the Flayer Youngling can do that last little bit of damage if the Idol dies. Xu-Fu Starts with Moonfire which gives him a healing bonus on Feed. Start with the Yeti. Use Metal Fist because the Yeti is slow. Then Call Lightning on second round to counter Moonfire. Then switch to the Zeplin and use Bombing Run. Put up Decoy to block feed and keep using Missle until your Zeplin is dead. Use your Dragonling in the same manner and cross your fingers he dies. If you don’t have a Yeti you can start with the Zeplin and bring in Menagerie Custodian last to try and finish him off with Ion Cannon. I found this guy and his Wish ability to be the hardest. The first time I used the below set up to beat him, but I think the second set up works better. I don’t have a Zandalari Ankerender leveled up so I tried this instead and it worked. Start with Golden Hatchling and use Call Lightning. Switch to Zandalari Toenibbler and use Black Claw. Then switch to little fawn and use Stampede. When the fawn is dead go back to Toenibbler to finish him. You can also use Skywisp moth for Call Lightning, and any other pet with a stampede type ability. Start with Unborn Val’kyr and put Curse of Doom and then sacrifice him with Unholy Ascension. Then bring in the Water Spirit and do Geyser and then Whirlpool (mine was at half health because I’d already used him on Chi-Chi). Then bring in Chrominus and use Howl and then Surge of Power. Ideally you will have enough pets to where you can allow this team to die or take massive damage and not worry about it so long as you win. My problem was I needed Chrom for later on with the celestials. I believe someone mentioned this in a post below but CoD with howl one shots each of his pets. I ran into snags like one of them would blind my chrom before I used howl and I would miss....bad luck with rng really. Thats why I don't believe this is a solid strat, takes a little luck on your side but if you knock him out first and don't get it to work the way you want simply leave and come back in. Rinse and repeat until you get your favored outcome so you can keep your pets healed and it worked out for me in the end. I hope this helps anyone having trouble and as always best of luck to all my other pet nerds out there. 1. Dancing Water Skimmer - pump build up, then cleansing rain, followed by pump again. Finish off the elemental with water jet. Use one more water jet against the golden pig. 2. Sunreaver Micro-Sentry - supercharge followed by haywire, the pig will waste his heal when you do the supercharge due to being damaged once by the water skimmer. 2 rounds of haywire will kill it. 3. Pandaren Fire Spirit - use fel immolate with your micro-sentry until 1 round remains on lil'blings armor. Swap to pandaren fire spirit and use conflagrate. keep immolate up, otherwise just spam burn. 2. Pandaren Earth Spirit - mudslide to get rid of stormy weather, then rupture and spam stone shot after that until it dies. I needed to have this pet up for at least 1 round against the wolf or I would always lose. Just use whatever, the wolf will dodge it. 1. Amber Moth - start with slicing wind, followed by moth dust, then use cocoon strike. Spam slicing wind until the fish dies. keep fighting the magic spirit thingy until it kills the moth. 2. Scourged Whelpling - keep a lookout on the enemies ward. If it's available for the current round, use death and decay. Put plagued blood up when it doesnt have it's ward ready, and then just spam tail sweep. I found the scourged whelpling to be extremely useful against this guy. It's overall just an awesome pet to have. When the magic spirit dies, I usually had very little hp left, or died and had one round left. Use tail sweep until your scourged whelpling dies to the water elemental. Try to time it, so his dive is on cooldown when your eternal strider enters. Even better if you can soak the other two-round ability with your whelp. 3. Eternal Strider - pump, pump, then water jet until the elemental dies. I had most trouble with Shademaster Kiryn due to the pesky turrets the mechanical cat puts out. The most important thing is that you have something that removes stormy weather. I really liked replacing it with muddy weather, because then he can't swap pets if the cat gets stunned. As for the celestials, refer to globex45's post and many others in this comment section. Special note: Save Wise Mari for last. If you for some reason make a mistake on another fight, you can fight Wise Mari, use the first round with a heal that heals all of your pets, and then flee. Repeat until you have healed up your injured pets, as long as they havn't died. You can do the same later at the celestials against Yu'la. This saved me some time at least. I found that Lil Bling is absolutely amazing vs Wise Mari. Start with Make It Rain, followed by Inflation. Refresh Make It Rain when there is still a debuff from Inflation. Use Blingtron Gift Package on cooldown. Use Inflation as filler. You can repeat the above sequence/priority on the 2nd of Mari's pets. If you find you need the heal from Blingtron Gift Package, you can wait for him to cast his Ward to force a miss. This should be enough to kill the 2nd pet too. Just spam Inflation for pet #3, and eventually your Bling should die casting this, leaving a 2 round debuff for 100% extra damage. At this point summon a Zandalari Anklerender and casting Black Claw, followed by Hunting Party. 3rd pet wasn't required for me. The line up changes every week but the 4 pets in the middle, Chi-Chi, Yu'la, Xu-Fu and Zao always stay the same. If you're looking for a guide specific to the Celestial Tournament (with videos and proven strats), please check out: http://wowpetbattle.com/celestialtournament.html. Note that cageable pets could be purchased from AH or shared with friends who already have a lvl 25. I listed CAGEABLE alternatives, so that you can quickly buy or borrow the pets you need. Or, you know, hand over victory to a friend with a level 25 pet. RNG is always there - this worked handily multiple times for us, if it doesn't for you - try again, you'll get it. Shademaster Kiryn: Restless Shadeling 121 (or Giant Bone Spider 121 CAGEABLE), Terrible Turnip 212 CAGEABLE (perfect counter), Anubisath Idol 211 CAGEABLE. DOT, then first ability nuke until dead. Seed, sons of the root, wave spam until dead. Finish with demolish. Wise Mari: Gilnean Raven 121 (uncommon) CAGEABLE, or Lil' Bling, Mechanical Pandaren Dragonling 112 (uncommon) CAGEABLE , Any Mongoose 122 (or Viscidus Globule 212 CAGEABLE). Peck, Call Darkness, Nocturnal Strike, Call Darkness again asap if possible. Decoy, spam Breath until dead. Bite spam, avoid with dive. Don't forget survival when low. Blingtron 4000: Any Strider (or Aqua Strider CAGEABLE 112), Panther Cub 212 (or Any Stone-upgraded cat 212 CAGEABLE), Fel Flame 111 (or Pandaren Fire Spirit 112 CAGEABLE). Water jet, Pump, Pump when his armor is gone, else jet til dead. Prowl, Pounce til dead. Immolate, Conflagrate when armor is gone, else Burn. Wrathion: Mojo 212 CAGEABLE, Anubisath Idol 121, third strong vs dragonkin. Swarm of flies, tongue lash spam, heal when undead immunity procs, tongue lash til dead. Crush spam, dodge bolt hit. Third should be mopping up (301+ speed helps to go first). Chen Stormstout: Lil' Bling 211 CAGEABLE, Rabbit 121, Water Strider 112. Inflation, then Make it Rain. He drops even if you're stunned. I swap the rabbit in, eat his swarm which hurts, burrow, scratch but dodge when locust swarm comes off cooldown. Get as much damage in on Brewly with burrow and dodge use to avoid inebriate and barrel toss throw. Nuke with water jet, finish with Lil' Bling Make it Rain if needed. Taran Zhu: Maggot (Mr. Grubbs 222 is CAGEABLE), Scourged Whelpling 211, Restless Shadeling 121 Consume, Sticky Goo after stun, Consume/Goo but try to save Burrow for his next stun, Consume/Goo until Li comes out, nuke him as much as possible try to burrow his spin kick. Took a while but I could often kill both Yen and Li with Mr. Grubbs. Bring in other undeads to finish off their team. Sully: Any frog, Mojo 212 CAGEABLE, any Moth (Imperial Moth 111 CAGEABLE), Gilnean Raven 221 CAGEABLE. Swarm of flies, Tongue lash until dead (get swarm up again before you drop). Cocoon burrow and nuke with your two fliers, Moth and Raven went very well even when frog died early to crits. Beat handily all 6 tests, 3 manned twice. Dr. Ion Goldbloom: Sunreaver Micro-Sentry 211 CAGEABLE, Lil' Bling 211 CAGEABLE (x2)/ I two-manned this team all 6 tests, was close three times. Armor, Storm, Immolate, switch, Make it Rain, Inflation, then gift package if you can but make sure to get another make it rain off, finish with Sunreaver. Bring any mechanical (dots ideal) as your third if you're nervous. Haven't lost a celestial fight yet in 8 weeks. Xu-Fu: Tranquil Mechanical Yeti (uncommon) CAGEABLE 112 and Lil' Bling 211 CAGEABLE, Iron fist, Lightning storm, switch, Make it Rain, Inflation, finish with Yeti. 2 manned many times, but had Clockwork Gnome CAGEABLE 111 lose half health finishing once. Zao: Skywisp Moth 212, Cogblade Raptor 211, Clockwork Gnome 111 (alive from Xu-Fu) Reckless strike, Cocoon strike, Call lightning, Swap to raptor, Exposed Wounds, Batter til dead (two manned all three times, but grab a second cogblade, or use Clockwork Gnome left from Xu-fu as back up). Yu'la: Solo'd with Clock'Em 112 Jab spam, dodge after Yu'la flies. Brought Pandaren Monk 211/Kun-Lai Runt 222 as back up. You can use this same pet team for ALL the 4 last bosses (Chi-Chi, Xu-Fu, Yu'la, Zao). No need for any backup team! these 4 last bosses also dosn't change each week like the phase 1 fight bosses, so this pet group can last for a long time. tacts: always kill other bosses before Yu'la, leave her to end. start with the Pandaren Water Spirit doing Geyser, then Whirlpool. switch to Chrominius and do Howl and then Surge of Power. Switch to Darkmoon Tonk only if boss is near death and finish with Ion Cannon (Shock and Awe before if needed). if boss still high on hp - disband the battle. at Zao it maybe easier to do Geyser>Whirlpool>Howl>Shock and Awe>Ion Cannon. with this rotation non of the pets will die at any point. so in any case u see boss messed up your rotation or any pet is in danger - just disband, go to Yu'la and heal all the pets to full, then try again. healing at Yu'la: put Magical Crawdad in the team and use Wish. switch to the injured pet and he get fully healed. disband fight and do it again with another injured pet. rotation there are: Geyser > Howl > Surge of Power > Shock and Awe > Ion Cannon. no Magical Crawdad for team healing here, but unlike The Celestial Tournament, you can just revive the team if it fail once. usually it work on first try. NOTE: The Nexus Whelpling is required; the other two can be replaced with any pet with MANA SURGE. Chi-Chi is my favorite celestial to kill because I basically sit back and watch her die. I've had 100% success rate, but I could see a potentially see it failing if a mana-surge manages to miss other than when she blocks. NOTE: The Robo-Chick is sometimes unnecessary and can be potentially replaced with mechanicals that benefit well from Call Lightning. Most of the time, I can kill Zao with only 2 pets, the Sunreaver and Menagerie. The Menagerie's Ion Cannon goes off the same turn Wish would have saved Zao. Obviously this only shows 3 of the possible initial battles, since there are multiple that it can choose from each week, but the last four fights are the same weekly. Chi-Chi and Yu'la are by far the easiest. Chi-Chi is easily taken down with 2 snails, though sometimes it requires 3. Yu'la is soloed with Mr. Bigglesworth. I don't have any of the newer pets in my arsenal that a lot of the other people here suggest. I don't use any of the Darkmoon Pets, either. I gotta agree with the people who say this isn't very fun, but I'll probably end up doing it for the pets. However, I gotta say the most amazing thing about alot of the strategy posts on here is how so many depend on having the same kind of pets maxed to level 25. I never for a second thought about maxing more than one snail for instance. I really have zero interest in doing that. If it comes down to having to level the same kind of pets over and over just to win this I'll pass. I'm a pet collector basically. I only do pet battles because I need to do them to collect pets (I haven't done one match against another player and probably never will). I don't think the pet battles are well designed or even interesting, there is way too much RNG involved. Tried a few times and found it to be a bit harder than first expected. So I looked over a few guides and tried again. The first round is quite a bit easy, I found the second being the challenge. Any pet with Unholy Ascension will do(there is only 1 other Unborn Val'kyr). Use it as your passive is activated. Alpine Foxling, any fast pet with Howl will do. Howl, then use Bite to get it down (if needed) - Mine died after using Howl, but the attack is impressively strong, and should work well for many other legendary pets. 1: Wild Magic - Seems to be important to start with, forgot to use it, and needed 50 dmg in the end, making this combo fail. Once your Passive goes off, hit him with Rot. (his changes him from Flying type to Undead, making Critter damage deal a lot), Change to the rat. Tried another tactic which worked. 1-3 Shadow Shock (until you can cast 1 spell before passive) --> Curse of Doom (round right after she cast ethereal) --> Unholy Ascension. Crimson Geode(Feedback/ Amplifying magic /Elementium Bolt) Any Geode will do. Used this to finish it if Geode died before job was done. keep a pet to finish if luck is out (many claws miss). Gave me a bit of grief. Tried multiple times with a strategy to Call lightning, then use flock/Swarm, but it didn't get it to work. So I tried 2-3 x Darkmoon Tonk, which seems to work well. You can substitute with Darkmoon Zeppelin. 2: Missile until you only can cast 1 spell before dieing. 3: Ion Cannon, powerfull, but stuns you. Use it as last spell before you die. I tried it out as my standard team failed. 1 Missile missed, and there were time enough to make another attack with Darkmoon Tonk before Ion Canon and still not have Xuen use his healing attack. Hey guys, I won the tournament yesterday around 20:00 CET / Server time. Today I tried to enter the tournament again and I couldn't. Opened up a ticket and the GM confirmed that the Celestial Tournament resets on Tuesdays and not on Wednesdays like normal weeklies do. I posted this under a different name but first time trying this strategy I had no problems. Use the Terrible Turnip for group heals against Yu'la before each new pet battle (Heal and then Retreat). You might have to do this a few times before all pets are at full health. Yu'la was the last one I defeated just so I could heal my pets. Yu'la does not attack on the first move. For both Zao and Xu-Fu I use pets who have the Call Lightning ability. Both will start in my line-up and are followed by Clockwork Gnome. The line-ups are completed with random mechanical pets who are strong vs beasts. The trick is that you use Call Lightning on your death turn, so you benifit most from the bonus to mech attacks. If it's hard to time the Call Lightning spell correctly, it helps a lot to bring your pet with less than full health. For instance I use Skywisp Moth against Zao, and I bring him with 800 health. Use Reckless Strike, Zao will only charge his batteries. Use Call Lightning next, and Zao will one-shot you, as desired. Make sure your Skywisp Moth has more than 50% health, otherwise your speed drops and you no longer go first. For Yu'la I use Feral Vermling first, he has 289 speed over Yu'la's 287, which is essential. All you need is Backflip and Crush, and you can almost solo him. Restart the fight if you miss any of your first 3 attacks. Finish him off with a Kun Lai Runt. For Chi Chi the strategy with Rapana Whelks is awesome, as described above. Thanks for that. Looks like this quest resets on Wednesday now (EU). Completed 20131202 and got it again today 20131204. Got my achiev today, and since I realise not everyone has the pets that are in the guides here like myself, I figured I would write a guide myself of the combos I came up with to defeat the scenario. I survived with the third pet at half HP. This was a near death situation but it got the job done. I always start facing taran zhu cz he's the hardest. 3rd pet had 75% HP left. Seriously any pet, he just won't survive the first 2 pets combo, with 2nd pet at 75% HP. Yes, same as above, but here the pandaren water spirit will die. u might use the 3rd pet to finish of but I don't remember i did myself. first 2 were enough to get yu'la down to be 1 hitted to death with the kun-lai runt. That's my guide and that's how I got my achiev today. Please note that below strategies are not always a guaranteed win, sometimes you may get unlucky and have to start over. Pets (in this order): Jungle Darter, Alpine Foxling (Kit), Flamering Moth. Swarm of Flies > Tongue Lash: repeat until Jungle Darter dies > > Howl > Bite: repeat until Alpine Foxling dies > > Alpha Strike + Moth Dust on cooldown until win. Drain Power > Mana surge > Focused Beam: until Arcane Eye dies > > Extra Plating > spam Metal Fist & use Siphon Anima on cooldown until Son of Animus dies > > Backflip > Crush. Prismatic Barrier > Nether Blast > Drain Power > Nether Blast: spam until he switches pets > > Decoy > Missile: spam until Darkmoon Zeppelin dies > > Plagued Blood > Shadowflame: spam until win. Curse of Doom > Shadow Shock: spam until Unborn Val'kyr dies for the first time > Curse of Doom > > > > Infected claw: spam until win. Metal Fist > > Supercharge > Metal Fist > Metal Fist > > Howl > Bite: repeat until "Brewly" comes out > Dazzling Dance > Howl/Bite until Alpine Foxling dies > > Whirlpool > > Surge: spam until win. Howl > Scratch: spam until Core Hound Pup dies > > Backflip + Crush + Crush: repeat until win. Finish off with Kun-Lai Runt if necessary (use Takedown). Tail Sweep > Call Darkness > Tail Sweep: repeat until Scourged Whelpling dies > > > Whirlpool > Surge: spam until win. Dive > Shell Shield > Absorb: spam until Dive is available again, if he lasts > Dive > > Howl > Burrow > Thrash > > Flamethrower > Conflagrate. Mangle > Thrash > Deep Freeze > > Flamethrower > Magmawave > Conflagrate > Magmawave > > Deep Freeze > Mangle > > Decoy > Missle: spam until win. Call Lightning > > Build Turret > > Stampede. The fight will bug out when the Squirrel dies, you win. Geyser > Wirlpool > > Howl > Surge of Power. Curse of Doom > Shadow Shock: spam until Unborn Val'kyr dies for the first time > Unholy Ascension > > Blessed Hammer: spam until Murkalot is on low health > Rightious Inspiration > > Surge of Power. Call Lightning > Cocoon strike > > Heartbroken > Zap > Zap > > Call Lightning > Stampede. Glowing Toxin > Scratch > Cocoon Strike > Scratch > Glowing Toxin > > Frost Shock > Deep Freeze > Take Down: repeat until Kun-Lai Runt dies > > Fury of 1,000 Fists > Jab. Hi, i made a little something that could be useful for some. It's a compilation of my current pet-teams for every trainer in the tournament, as well as the 4 celestials. Most of the pets of course have viable substitutes, but this is what i have had to work with, and it is working fine for me so far. This tournament is HIGHLY frustrating. ONE mistake means you have to start all over again... and "mistake" includes having your pet miss, or having your opponent crit. Either of those happens, during the whole tournament, and you're starting again. Note that your opponent missing, or you critting usually doesn't even gain you one round worth of progress. I want to make a quick post about killing the 4 celestials, just to give my take on it. For reference on any pet or ability I am posting, you can go to Warcraftpets.com and type it in the search bar. FYI, I updated and simplified this post so I hope it helps even more! The standard strat works well, Pandaren Water Spirit using Geyser, then Whirlpool, then swapping to Chrominius who uses Howl and Surge should decimate Chi Chi. This combo actually works on all 4 celestials, but where's the fun in that? Edit: I have also found a 100% reliable team that separates from this standard strat and is actually quite fun. The key ability is Spirit Spikes and is best used with Vengeful Porcupette. The other 2 pets are Living fluid and Nether Faerie Dragon, but you'll find Vengeful does most of the work. Open with 2 rounds of Powerball. Use Spirit Spikes on round 3, the trick is to use it the same round as he uses dodge, that way he will hit you while you have the buff the following round and he won't benefit from his heal afterward. After that round is over and he gets really damaged, keep spamming Powerball until you are faster. Once that happens spam flank until he kills your pet. At that point he should be low enough for almost any pet to finish him off, but its fun to have a team strong against him. Give it a try! Pandaren Monk solos this pet if Yu'la misses a lift-off or fails to get a single critical hit. Start buy using Blackout Kick then using Takedown. By stunning him first round, you prevent him from shielding giving you 2 rounds of full damage Takedowns, the first being double damage. Proceed to use Staggered Steps the round he is up in the air (since you are faster). Use Blackout Kick on cooldown, contrary to what I posted before, as this will lower the total number of rounds he hits you. Due to his humanoid healing, he can solo Yu'la under normal circumstances. Any humanoid with big hitting attacks strong against Dragonkin can be used as backup, but none are as effective as the Pandaren monk. These pets are both beasts that heal themselves, making the strat for each of them essentially identical. If the strat is used right, the ram shouldn't get his heal off and the tiger's heal will seem miniscule. If using all mechanical pets, you should strive to keep all your pets alive, letting you use the same 3 for the second fight. Despite this, it is good to level 2 sets of 3 pets following the breakdown I'm about to describe so you can guarantee easy kills on both these Celestials. Your first pet needs to have Call Lightning and preferably a periodic damage ability to accompany it. Your second pet needs a method of causing double damage on the target. Your third pet simply needs an attack that hits multiple times. Combination One: Sunreaver Mirco-Sentry, Lil' Bling and any pet with the Batter ability. This combo is best used on the Tiger. Combination Two: Any of the Cloud Serpent pets, any of the Zandalari Raptors and any pet with the Batter ability. This combination is best used on the ram. In combination one, use Call Lightning, Fell Immolate and swap to Lil' Bling. Use Make it Rain and Inflation next. If Bling dies, finish him with your Batter pet. In combination two, use Cyclone and Call lightning followed by LETTING THE PET DIE. Bring out the Zandalari and debuff him with Black Claw followed by Hunting Party. Finish him with your Batter pet. Using combination two on the tiger may get the raptor killed before he gets off his Hunting Party, this is the reason you should use Combination one for him, but he should still die simply with the Raptor's debuff ability and being hit by Batter a few times. With this strat, you essentially need 2 pets to kill Chi Chi, 1 pet to kill Yu'la (if you're not unlucky) and as few as 3 pets total to kill both Zao and Xu-Fu. Obviously having backup pets with similar abilities is essential to help negate mistakes, but this is the core of the pets you'll need. As it is account wide, you can turn it in on lower level toon, if you travel to the isle. Even through you won't be able to do the tournament requirements you can just switch over to turn it in. Giving standard quest experience, as well as valor to your alt. Hello guys just wanted to share my experience with this. I've come up with a tactic to beat the 4 bosses in the final stage that only requires 3 to 4 pets TOTAL! Any pet with decent humanoid abilities (for extra damage VS dragonkin). Kun-Lai Runt for example. !Note: Save the dragonkin, Yu'la for last. !Note: if u notice one of your 4 pets is about to die (crit for example) just surrender the battle before it dies. Don't be greedy, it isn't necessary! Now he will take 70% health and be stunned, finish him off with Surge of Power. Battle the dragonkin Yu'la and start with your Frog. Cast Cleansing Rain to heal your pet team. Surrender and battle him again. As he always starts with a non-damage ability this works very well. Rinse & Repeat until your pets have full hp. Do exactly like step 1 (Chi-Chi) and Xu-Fu will die as well then repeat step 2 to heal your pets. This pet is more resilient than the others and requires an extra step. Start with Frog and cast Cleansing Rain. Then the trick is to wait 1 turn before swapping so the frog gets hit by the big damage ability he has so just cast Water Jets. Swap to Pandaren Water Spirit and cast Geyser then Whirlpool. Repeat Step 2 to heal your pets. Start with your humanoid pet and just try to damage him as much as possible before it dies. Bring in Pandaren Water Spirit and do Geyser -> Whirlpool combo. (Make sure Yu'la's ability Lift-Off DOESN'T have a 3 round cooldown when you start the combo, if it is then u gotta do Water Jet first then do you combo. Swap to Chrominius and do Howl -> Surge of power to finish him. If you wanna try to do it with 3 pets you start with frog Frog kiss -> Cleansing Rain -> Frog kiss until your frog dies and then do the water spirit+chrominius combo. The Pandaren Water Spirit+Chrominius is also very useful for doing the beasts of fable bosses quickly and easily. Hope this helped you, fellow pet battler. These are the pets i do celestial depending on you what you can change the set up. -Mechanical dragonling;Decoy,bomb,breath.Decoy first pun bombing run then spam breath. I killed the last of his with Dragonling after my death the bomb dropped and he was dead 3rd pet was a Kun-Lai runt. -Undead:Arctic Hare(flurry,dodge and burrow) use dodge then burrow. -Locust:Chrominius dont use howl beacause monte will burrow first use howl bite and ravage Howl again ,alpine fox kit is good asweel to. Beside the fact that they change in between no biggie. -Hopling will finish the job or any other pet that gives extra dmg in dragonkin. -Lost of Lordareon:curse of doom,siphon and fist skill is at you choice . -Wild hammer hatchling;Flock and slicing wing. -Dancing water skimmer my rapana died in 1 try;pump,water jet ,water jet again(he is faster than you and he uses and nuff that reduces dmg tanken when you will use the pump that buff will pass. -Electrified razor tooth with :Rip,Blood In the Water and LIghtning shield. -Ruby Sapling :Iron bark,throns and the Runt dies.Cat comes,Iron bark ,entanglings roots then iron bark again.The wolf give a dodge spell at first wait one round then cast roots again. -Pocket reaver:Supercharge and metal . Use Mr. Bigglesworth with this rotation ;Claw ice tomb ice barrier(be sure to pass after his lift off hits. -Kun-lai runt:Takedown,Frostshock,deep freeze try hit her with deep freeze when the buff that reduces damages ends. -Bonkers: If you are lucky with runt you won't need bonkers. -Clockwork Gnome:build turet and switch to blighted squirel. -Blighted squirrel:When you cast stampede you put the debuff for 100% dmg and turett do double dmg and yes when squirell dies you win. -Chrominius:howl(don't use surge after you wil the surprise for boss to reamin with 43 or 65 life and you 2 round of recovery)Bite then surge. Write me if you have any problem with completion. I refuse spending 100 hours on this celestial garbage, so I will wait until WoD and do this with level 30-40 something pets instead, srsly this challenge is not to prove skill only to prove patience and waste time of players.. I'm posting my technique so I don't forget and maybe anyone else can benefit from it. Actually it's a gathering/adapt to my pets from other posts. 2: Swap to Zandalari Anklerender. Soaks the charge. It's slow but quite secure. Keep a pet to finish if luck is out (many claws miss). 5-7: Switch to Zeppelin, spam Missile. 8: Use decoy. It's very important to soak Feed on this round. Always make this the last fight. It's useful for healing a pet if something went wrong with a group and you want to retry without leaving instance. Just use an AOE healing pet on the first round and abandon fight as many times as necessary. Any other backup backup pet. Should not be needed. If he survives, finish him up with Chrominius and the backup pet. The entire thing is incredibly retarded. The event is not a challenge to you or your pets. It's a puzzle where you have to have exactly the right pets described by in the guide or you lose. It's just a huge, huge grind to get the pets all to 25 and then have to perform, like a robot, the same moves for each opponent, each week, for a month if you want one of the nice looking pets. Probably one of the worst things that Blizzard has put into the game. They shouldn't have to gate the four celestials off with three random trainers. This guide is something I put together during MoP and has earned me all rewards from the tournament. I've shared it with my guildies and they encouraged me to post it. Please let me know how it works for you! :D I also want to give credit to all the posts on all the forums, including wowhead posts that I took bits and pieces from to fully flesh this out. I recommend healing your pets right before you go in. That saves you the pain of finding out one of your last needed pets was already dead when you started! Strat: Cocoon Strike on cd, then Moth Dust on cd, Alpha Strike in between. **Don't ever switch pets, even if you sleep, just burn them down one at a time. Strat: Powerball x2, Tounge Lash x3, Survival and lash til dead. Roar, Scorched Earth, then punch til dead. Frost Shock, Deep Freeze and Takedown. Strat: Tantrum and Zap til dead. Hiss, Burrow then Poison Fang. If you get to Brewly, then Poison Fang and Hiss before you die. Switch to Water Skimmer. Pump x2, jet (1-2x) if need be. Strat: Flamethrower (he'll dodge it), Moonfire, followed by Ancient Blessing, then Flamethrower until he swaps out. As soon as he swaps to Trike, swap to your Moth. Moth Dust, Cocoon Strike and Alpha Strike until your moth is dead. Bring Celestial Dragon back in and Moonfire. Get Skreamer down again with your Celestial Dragon. When he swaps to Chaos, bring in your Scourged Whelpling and kill him just using Tail Sweep. Keep using Whelpling until he dies, then swap back to Celestial Dragon to finish him off. Strat: corrosion, expunge (fingerscrossed) then Ooze Touch until Slimelingis dead. The first wave from Patience should kill slimeling, then you're safe to use Decoy. Bring in Dragonling. Decoy, Breath until dead but bomb Knowledge right before you switch to Idol to finish up! Strat: rain, swarm, tongue lash until Socks is dead, then swarm Monte before dying. bring in the snake. Burrow (after he's burrowed) then hiss, and bite til snake is dead (get a burrow in if Rikki misses), switch to moth, keep toxin up and cocoon strike on cd, then slicing wind til dead! Strat: Rain, Pump, Pump when his armor is gone, else jet til dead. Howl > Burrow > Thrash > > Flamethrower > Conflagrate. Strat: Peck, Call Darkness, Nocturnal Strike, Peck, Peck, Call Darkness again asap if possible. Decoy, spam Breath until dead. Bite spam, avoid with dive. Don't forget survival when low. Strat: Death and Decay, Shadow Shock, Death Coil, then Shadow Shock til dead. Seed, sons of the root, wave spam until dead. Finish with demolish. Ooze Touch until dead, keep counting 1, 2, 3 for each round switch back to first pet, keep acidic goo up, then on the next ethereal/dive round he should die. Strat: CAST WATER JET FIRST - Then Geyser, Whirlpool. Swap to Chrominius – Howl, Bite, Surge of Power. WIN. BACK-UP teams for Yu'la -- I found that I'd make it this far, then have trouble killing Yu'la time and time again >.< so best of luck! Strat: Elementium Bolt, Tail Sweep, Call Darkness, switch to Monk, Focus Chi, 1000 Fists, Takedown, Takedown, Focus Chi on liftoff, 1000 Fists before dying. Switch to runt, Frost Shock, Deep Freeze, Takedown, Takedown. win. Here is the lineup I used. Most of my pets are fairly easy to obtain, so if you're still kinda new to battle pets you can use these. The bosses I got this time around were Lorewalker Cho, Dr. Ion Goldbloom, and Sully “The Pickle” McLeary. I haven’t battled the other bosses out there yet, so I will only be covering these 3 and then the 4 beast bosses. Okay, here we go! This fight using these pets worked for me the first 5~ times I was doing the tournament, but lately it's been kind of iffy. I think I need to find a replacement for the Proto-Whelp since mine is uncommon, and if you get unlucky and Chaos crits you a lot, you tend to lose. I used gbarger’s strategy for this fight. Using a frog and moth make this fight VERY EASY. However, there was one round where I was doing this boss, and I was SO unlucky. I went through 4 teams before I was able to beat him. But the moral of the story is, if you lose once don’t give up! Any frog level 22+, any beast, and any moth 22+ (or maybe even lower idk) can beat this guy. So if you lose the first time around, just scan through your pets, see what you’ve got, and try again. I used stym’s strategy here. TYVM STYM. Snails are the king of the castle in this fight. I used a Rapana Whelk and a level 23 Silkbead Snail, but as stym stated, any snail will do. I didn’t even need a third pet. Just follow his instructions, and you’ll be good to go! I used RantsiProduction's strategy for this fight, and it worked perfectly even though it's meant for Xu-Fu. I tried many of the other tips listed on wowhead for Zao but was unsuccessful. This strategy is the best I’ve found. I used Unborn Val’kyr and an uncommon Alpine Foxling Kit. Didn’t even need a third pet. I used kissashark’s strategy here. If you are unsuccessful, I recommend watching her youtube video first. All you need are some cute little bunnehs and you're good to go. I used a combination of strategies since I don't have any mechanical pets with Call Lightning. I used Hydraling for Call Lightning, then used Clockwork Gnome for his turret, then switched to Lil' Bling and used Inflation until he died. Apparently there's some type of bug where the battle ends with Xu-Fu with a fourth of his health, and it says you defeated him. Whatevs, it would've worked! Don't waste your time. The quest is bugged and can't be turned in / completed. Did the tournament twice in the last hour and both times I couldn't turn in the quest. Has Xu-Fu been buffed recently? Something is not right. I've been collecting and leveling dozens and dozens of rare 25's from these lists to prepare for the CT for 2 yrs now and have defeated all of the masters and final 4 many times without issue -- the strats suggested in this thread are really great, ty all! For some reason NONE of them have been working for me on Xu-Fu this week. Not one. At one point I was so frustrated I managed to burn through almost 200 of my rare 25's in various combinations trying to take him down. Tried mitigating his heals. Tried mitigating his damage. Tried Howl bombs to maximize my damage. Used several pets with Lightning Storm and mechanical abilities. Tried pet classes that his abilities would be weak to. Tried some with dodges that would keep him from healing (tough to time!). Tried pets with their own heals (which is futile -- he kills most in 2-3 swipes; you'll never have a chance). Tried fighting him first out of the 4 instead of last. I'm at wit's end. All of the pet combos I use (I have extensive notes) have been working fine on all of the other masters -- this one this week is just not working. Anyone else having exceptional issues? If you can afford to keep duplicate pets, I suggest getting two water pandaren spirits for the second part of the tournament. You can easily howlbomb chi chi, zao (use bite before surge of power), and xufu, and mr. bigglesworth destroys yu'la on his own. Xufu is problematic but can be done with the same strategy - if either of his first two abilities crit your water spirit dies (and you'll have to clean up with a third pet (don't use a critter). For as much as I've heard do Xufu first so you can restart quicker if things go wrong, I suggest starting with reliable (chichi), going to zao 2nd as only the water spirit is at risk, then doing xufu third as he's either going to kill the spirit 100% of the time OR put chrominius at risk too, and Yula last to heal on. szechuan chicken(other swarm guys work too). Yu'la - Mister Bigglesworth. (combo thanks to valepu). Xu'fu - Tranquil yeti, szechuan chicken, clockwork gnome. Start with yeti into thundersorm. Zao - We're almost with the same pets here, add chrominius to the team. That's that, celestials with 6 pets. I don't think you can do it with less, unless someone comes up with a pet that can solo Chichi. Anybody else think this is way to close to Dragon Warrior Monsters "Starry Night Tournament" to be a coincidence? Pets: Bone Serpent, Molten Corgi, Blue clockwork rocket bot. Tacts: Use barrage/pass, call darkness, nocturnal, then barrage on cd until serpent dies. then swap molten corgi and use flamethrower and puppies of the flame, flamethrower on cd until Stormoen dies. after summer kill your corgi, take bot and use launch rocket and toxic smoke, and you should win. My question is: How come every time an opponents Battle Pet has a skill with an 50% chance to hit, hits 8 out of 10 times, and when one of YOUR pets has a buff that reduces his chance to hit for.. let's say 25% it misses about 6 out of 8 time it tries to land a hit? Ok i understand it is an RNG thingy but.. comm'on every time? In my opinion Blizzard must fix their RNG algorithmus thing or just do not give % cause it is NEVER true. They can say for example "It may or may not deal 560 Beast damage" or something like "It deals 235 Flying damage and if you get lucky, it will stun the target for one round"
Because the % they give they are never EVER right ! I needed to let my frustration out.. And i think i am not the only one who was so mad when i saw : My Pet - 'Miss' , 'Hit' , 'Miss'.... and opponents Pet - 'Critical Hit' , 'Hit' , '50% chance skill HIT'. Thank you for reading my comment who has nothing to do with this Thema. To leave the scenario: right-click your portrait and click "Leave Instance Group"
Enemy pet Trike: Inflation until Trike is dead (if he stuns you, you will still probably be ok) You can do this 2x or use Make it Rain then Inflation again. Speak with Master Li to enter the Celestial Tournament and defeat all the challengers there. The Timeless Isle is home to a special tournament created to test the leadership of its participants. Those who prove their worth are granted an opportunity to befriend an embodiment of virtue - the progeny of the celestials themselves. Each time you win the tournament, I will honor you with a single ceremonial coin. When you have enough coins, speak with me again to further discuss your reward. A true leader stands before me. It is my honor to grant you this coin, <name>.